C-3PO Then Til’Raeda, Human-Sarnoth Relations. I considered mentioning in dialogue that the "shell" is a soft hard-light projection, but that felt a bit confusing to word out. Wow. That’s cool and a little scary. DX I wonder if it’s really broken or not. I am wondering how the SBI (Sarnothi Bureau of Investigation) knew about it so quickly. What detecting tech do THEY have to locate/know about it being sent out? And, of course, that means they are watching for it:) Tricky guys. Why ARE you looking for signs of it? Or did they already know she might have had some access to it and were… “keeping an eye on her.”? Yea, this. Last time the bow went off, they mentioned getting resonance readings from their house and that Selkie might have awakened so that seems to be a think that can happen and they were actively watching for. Her Mom is an important woman. That might be the reason why they’re looking for signs? Also the Echo might’ve been a reason why they’re monitoring everything. It sounds like it might be a huge problem. DX Or maybe a superweapon? 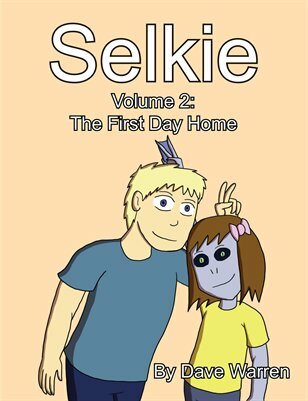 Selkie Comic is really good, Dave. Good job. THIS IS YOUR BOW’S TRUE FORM!!! The choice to make the bow cloth and a wrapping around the device is the better choice. You might want to have fun with science, but sometimes simple is best. You don’t have to explain where the power source for the hard light bow is for instance. Oh the power source is simple. My bet is it “leaches” off of Selkie’s bioelectric field. It’s still best to avoid explaining some things when a simple explanation is doable. Would you prefer that it be one of the old ones like Cthulhu in disguise? well, i would not object. kind of hard when one is going insane. Who shall be eaten first?! I have a feeling that carrying around Cthulhu in a pink bow on the head of a 8 year old probably violates all kinds of school rules. TSA probably won’t approve either. …have you read Hello Cthulhu yet? It’s the cutest Lovecraftian nightmare comic that’s happened to cross my path so far. Wait… So if it is a soft hard-light projection?… How do Sarnothi even use this type of science/energy under water where waves of light and sound are often distorted? Is there something in a typical Sarnothi town/city that negates water currents to be such a disruptive force to their otherwise awesome tech? It required working under such harsh conditions as water currents in order to actually develop the technology! – Also remember Sarnothi are always blinking a bit and twiddling a finger in their ear to try and clear it when they come up into the air because things just don’t sound right and there is this funny effect where the light is well, kind of overexposed, and makes actually seeing and hearing things a little bit difficult. It’s because air distorts sounds from what they are supposed to sound like. And light is the same. It’s weird in a pure air atmosphere.